If you’ve been looking forward to install OS X Yosemite hackintosh on your PC, then today’s your lucky day, as UniBeast has been updated to fully support Apple’s latest and greatest OS. Without wasting any more time, let’s dive right into it. 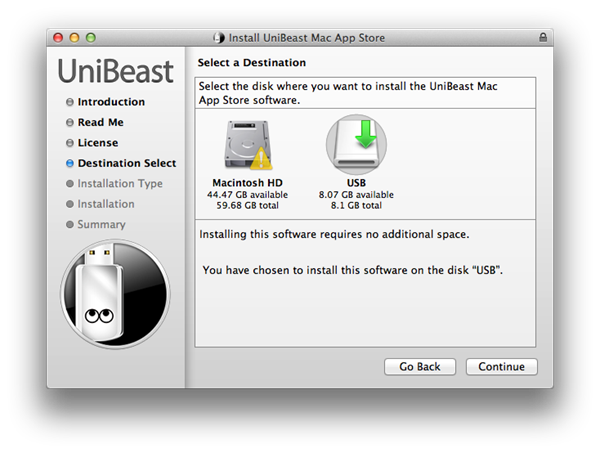 A Mac to download OS X Yosemite from the Mac App Store and for creating a UniBeast drive. An 8GB (or over) USB flash drive. An Intel-based PC capable of running Yosemite. 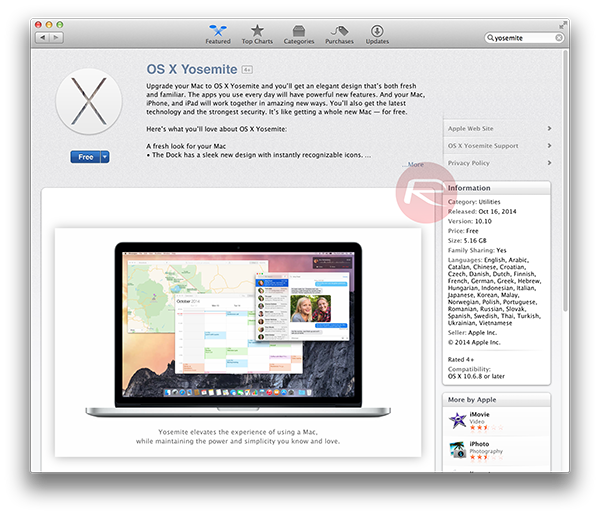 Step 1: Using a Mac, download OS X Yosemite for free from the Mac App Store. Once the download is complete, you can find the Yosemite download file in the /Applications folder. Step 2: Download UniBeast and MultiBeast from here. Make sure you download the latest version. Step 3: Using the Disk Utility tool on your Mac, format your USB flash drive. Launch Disk Utility and select the USB drive from the column you see on the left hand-side. Click on the Partition tab on the top, then click on the Current dropdown menu, and choose 1 Partition. Click the Options… button and then select Master Boot Record. Set the Name for the drive as ‘USB’, and for Format type, select Mac OS Extended (Journaled). Now hit the Apply button, then click on Partition. Step 4: Once the drive is formatted and partitioned, start the UniBeast tool which you downloaded in Step 2. Step 5: Upon launch, you might want to skip a few screens by clicking the Agree or Continue buttons until you reach the Select a Destination screen. Step 6: Select the USB drive you formatted and then click on the Continue button. 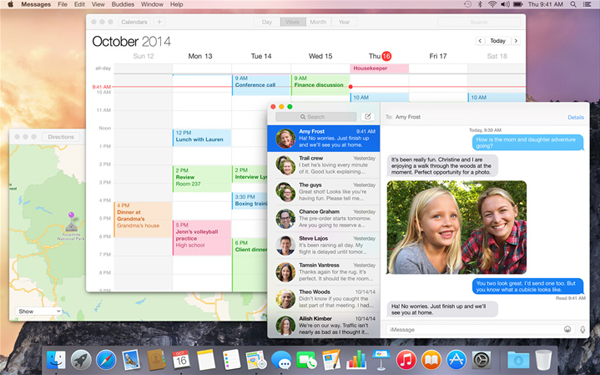 Step 7: Once you’re at the Installation Type screen, select Mac App Store Yosemite – 10.10. If you’re using an old system with Socket 1156 select Legacy USB Support. If you’re installing on a notebook, select Laptop Support. Step 8: If you’re all set, click on Continue, enter the admin password for your Mac when prompted for it, and let UniBeast work its magic in creating a Yosemite USB drive for your PC for installation. 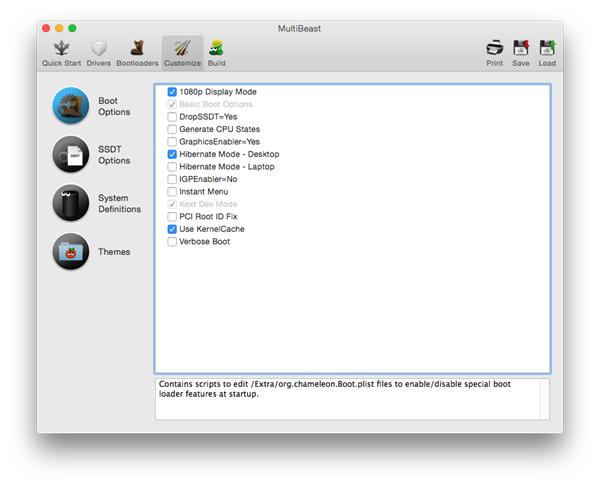 Step 9: When the new bootable Yosemite USB drive is ready, move the MultiBeast file downloaded in Step 2 to it. Step 10: Start your PC and boot into the BIOS setup, making sure that BIOS priority is set to boot from USB devices. Plug in the bootable USB flash drive and restart the PC. Step 11: When prompted to press a key to boot from USB, do so. You should now see the Chimera boot screen. Here, select ‘USB’ and hit the Enter key to continue. Select the HDD you want to install the OS X on, from the left panel. Click the Partition tab, then click on the Current dropdown menu, choosing 1 Partition. 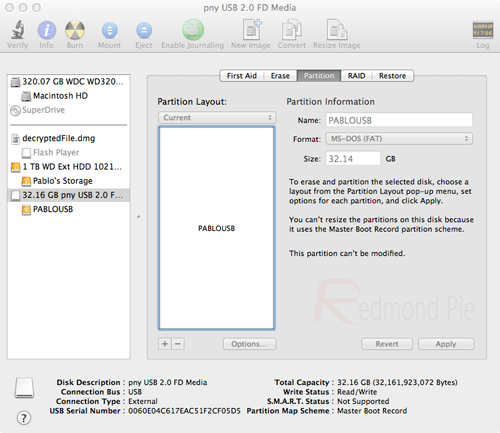 Click the Options… button, and choose the GUID Partition Method. Set the Name for the drive as ‘Macintosh HD’, and for Format type, select Mac OS Extended (Journaled). Once the options are set, hit the Apply button, followed by Partition. Step 13: When the drive format is complete, close the Disk Utility and go back to the installer’s main screen. Select ‘Macintosh HD’, which will be the drive where Yosemite will be installed, and then click on Install. Stay with us, you’re almost done! Once the OS X installation is complete, this HDD needs to be made bootable. 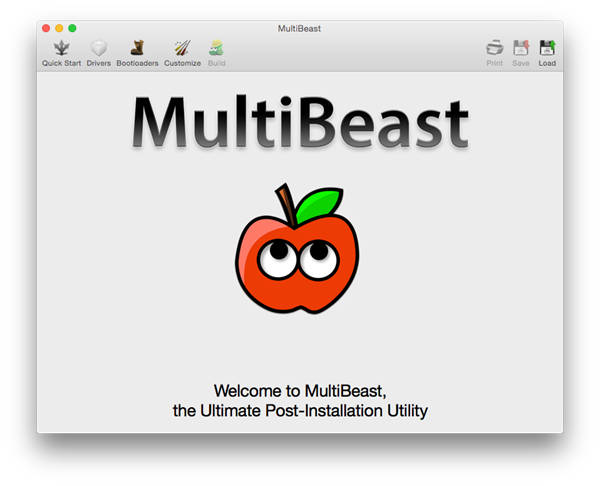 Do this using the MultiBeast Utility, which can also install the required drivers for audio, Wi-Fi, graphics, LAN etc., atop of making the OS X HDD bootable. Step 14: Reboot the PC again, booting into the bootable USB flash drive. This time select ‘Macintosh HD’ from the Chimera boot screen. Step 15: Launch MultiBeast, and check all the required drivers for the PC. Once that is done, click Build, and hit the Install button to complete the installation. You are there! 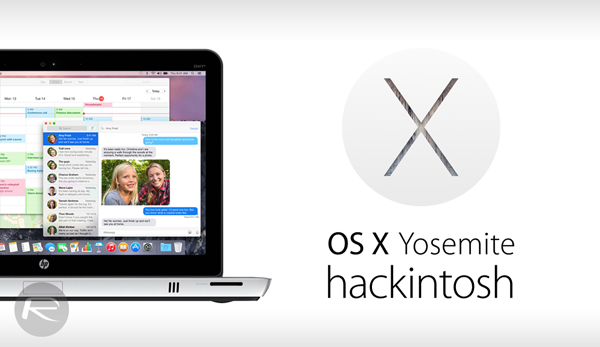 Yes, you have managed to convert your PC into a fully working OS X Yosemite hackintosh. Does this require specific hardware or just a PC with Intel? It’s not that easy. Gigabyte motherboards are recommended for a hassle free installation. I have a factory built HP pavilion desktop that I don’t really use cause I rarely use windows these days. It has a core 2 quad on it, will that work? Why promote controversal and shady tool from guys who live by monetising hackint0sh community efforts? There are better ways and proper tools. for a working hackint0sh, minimum requirement is core 2 duo.. so don’t worry, core 2 quad will work fine… in fact I also have core 2 quad and running OS X Yosemite great. I never understood why he gets the promotion, and Clover is always left in the dark. I assume it will be down to money, as everything is (especially with him). I made the move from his tools to Clover when I realised he was in it for the monetary gain (and dubious methods of creating his software). I’ve made the switch too and I never regretted it. Of course I got banned from his site for mentioning Niresh’s tools there. I’ve used clover with Mavericks and it’s way better than unibeast or multibeast. I got my setup running in UEFI mode with my overclocked settings. Only kext I used was for audio and Ethernet and injected with clover and updates didn’t require reinstallation and backup of kexts. These are things that Tony’s tools will never achieve. What about Core 2 Duo ?? 2 GB of RAM ? No quad here. I can run it off a partition no problem right? Don’t feel like removing windows 100%, although I could just bootcamp it but I have data I don’t feel like wiping. Don’t have a big enough portable drive to transfer everything. 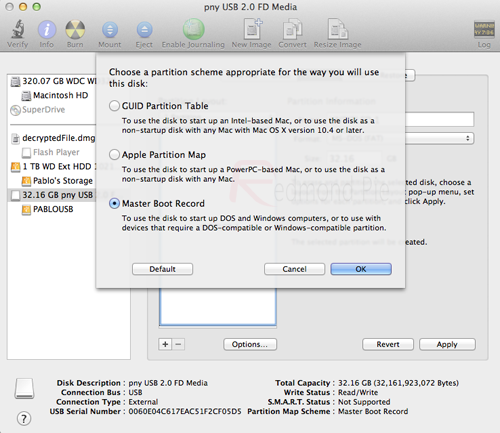 I can partition the drive in the Yosemite setup correct? link to a guide for Clover then? for Yosemite 😀 lol if its easy, why not. Its not that simple, but you can do it. 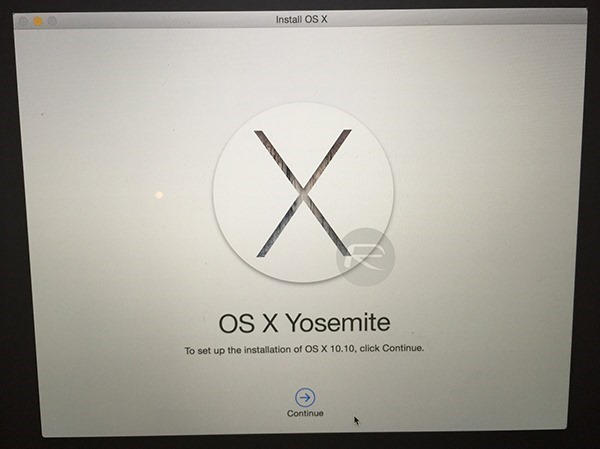 Is it legal to download free OS X Yosemite if you are not apple user ? You can download it in the Appstore what is legal. Otherwise it will be ilegal. I can’t downloaded it from my firefox windows using my PC. I tried itune and nothing. Think I will finally do this, question I have is my pc has 3 extra drives that have a bunch of movies on those drives, will they still work normally or are those drives getting formatted? Yeah, I know that. Obviously, not for PC. If I download it through torrent which is available right now. Is it illegal ? someone make a VMware image to download. That’s the only way I’m going to want to use any OSX. If Apple really wants to beat Windows, then it needs to just come out with an OS that runs on any Intel/AMD platform and leave it’s proprietary hardware to those people who really want that over-rated crap. Hello guys some help please, will it work on dell xps 14 model? I have intel core I7. Currently running Windows 8.1 Pro. Could someone who has tried this let me know how well it performs ? I had installed Yosemite the exact way how it was described in the above steps. But i am having a problem. My hackintosh freezing after few mins and i cant even move the mouse cursor. Everything getting stuck. It is happening mainly after launching safari app but it sometimes happening without even opening safari. I have the same problem. also I can’t get the sound work. what did you select for the audio? Is there a way to do this via vm? I would like to run both simultaneously with 8gb ram. Possible? Hi, I’ve got a problem here. I can see the Chimera boot screen (step 12) and after that apple logo which initialize the instalation. After few seconds from that screen is out (turn off / black) and computer block. Any ideas? Yes, I’m doing it via VMware on my MacBook Pro 17 retina with i7 and 8GB of ram. Everything runs perfect. Was actually torn between an iMac or a Windows All-in-One… If it performs well on a Hackintosh, may as well pick up a higher spec AiO for the price of the iMac..
so how do I install apps from the appstore without admin password? It will never work quite as well as a real iMac. Get the real thing, you’ll be happier in the end. Where i have to write this ??? could not run unibeast on my mac – it say wrong language and then exit….. i changed the hungarian os to english…. but ist still not run…..
“An Intel-based PC capable of running Yosemite.” how do i find out my PC is capable? It was working fine until i deleted those files …. I had the same question. I found a tutorial that let’s you do it without a Mac . Type that into YouTube and you should find it. I’m literally trying it now, hope it works!